Welcome to Upsilon Lambda's Website! Chartered on March 20, 2008, Upsilon Lambda is the STTI Nursing Honor Society chapter of MGH Institute School of Nursing, Charlestown Navy Yard, Boston, MA. 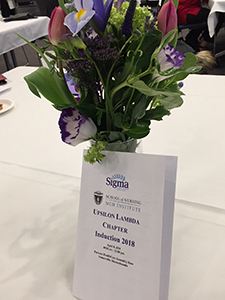 On Sunday April 8, 2018, Upsilon Lambda celebrated its 10th anniversary of being charted as a Sigma Chapter and inducted 176 new members! The ceremony was held at the new Partners Healthcare Asssembly Row Conference Center in Somerville. Dr. Rebecca Hill, Chapter President, welcomed the inductees and their family members and invited them to partake of a lovely brunch before the formal start of the ceremony. Dean Inez Tuck offered greetings from the Institute and School of Nursing. Dr. Neal-Boylan, the new Associate Dean and Professor at the School of Nursing, provided the keynote address wherein she alerted the attendees to the increasing importance for nursing role expansion beyond traditional hospital settings into the community and beyond. Former Chapter President Dr. Patrice Nicholas shared the background and meaning of Sigma and invited the new members to participate in our Chapter to advance their career development, volunteerism, and scholarship. Reflective of her message, Dr. Margie Sipe, Director of the IHP's DNP Program, received the Chapter's Paul-Simon Mentorship Award and Kathy Simmonds, Assistant Professor, the Corless Research Award for her PhD Dissertation Research.